A native of the Nagoya region in Japan, Dr. Kimata received his B.S. (1964) and Ph.D.(1975) in Chemistry from Nagoya University. He was appointed a research assistant in the Department of Chemistry there in 1967. In 1987, he joined the Institute for Molecular Science of Medicine, Aichi Medical University, as an Associate Professor. In 1991, he became a Professor and also Director of the Institute. Dr. Kimata has twice spent time in the United States at the National Institutes of Health (NIH): from 1978 to 1980, at the invitation of Dr. G. R. Martin, he was a Visiting Associate; in 1993-94, he was a Scholar-in-Residence. His current research is focused on the roles of the extracellular matrix, especially the physiological functions of proteoglycans. Lisheng Zhuo received his B.S. degree (1993) in Biological Science from Zhejiang University, China, and his Ph.D. degree (2001) in Medical Science from Aichi Medical University, Japan. He first developed his interest in glycobiology in the laboratory of Professor Ce Sun at the Shanghai Institute of Biochemistry, Academia Sinica, where he studied the roles of lectins in sperm-oocyte interaction. In 1997, after three year's experience in studying photo- and thermo-sensitive rice male infertility in Chinas National Rice Research Institute, he joined the laboratory of Professor Koji Kimata at Aichi Medical University. Since 2001, he has been a research-resident of Japans Foundation for Aging and Health. He is currently investigating the biological functions of the SHAP-hyaluronan complex. Hyaluronan is a linear glycosaminoglycan that consists of repeating disaccharides of β1,4-glucuronic acid-β1,3-N-acetylglucosamine. Unlike other glycosaminoglycans, hyaluronan is neither sulfated nor linked to a core protein. Despite its structural simplicity, hyaluronan exhibits a broad spectrum of biological activities by interacting with a large body of hyaluronan-binding proteins and proteoglycans.a While most interactions are non-covalent, the one with Serum-derived Hyaluronan-Associated Proteins(SHAPs) is covalent. So far, the SHAP-hyaluronan complex represents the only case with covalent hyaluronan-protein crosslinking. Recent work has revealed that the formation of this unique molecular complex is essential for some functions of hyaluronan as a predominant component of certain extracellular matrices. Molecules of the ITI family are composed of a common light chain, bikunin (about 40 kDa), and either one or two heavy chains (about 80 kDa) (Fig.1a) (for review, see ref. 4). Bikunin, the classic trypsin inhibitor, is a proteoglycan with a serine residue at position 10 of the core protein that contains an O-glycosidically linked chondroitin-4-sulfate chain with about 15 disaccharide repeats. The heavy chains are linked by ester bonds between their C-terminal aspartic acid residues and internal GalNAc residues in the chondroitin sulfate chain of bikunin.5 Such a protein-glycosaminoglycan-protein crosslink appears to be unique to ITI family molecules. Three distinct genes encode three heavy chains (HC1, HC2 and HC3, respectively), which are assembled in various combinations onto bikunin.4 Pre-α-trypsin inhibitor (PαI) contains only one heavy chain, HC3 in human and rodents or HC2 in bovine. ITI contains two heavy chains in heterogeneous combinations, such as HC1 and HC2 in human, HC2 and HC3 in bovine, and both types in rodents. Fig. 1　Schematic representation of inter-α-trypsin inhibitor (ITI) family molecules and their intracellular assembly. a) ITI family molecules are composed of a common light chain of the small chondroitin sulfate proteoglycan bikunin and up to two heavy chains of the three genetically distinct but related heavy chains. The C-termini of heavy chains are linked to chondroitin sulfate via a unique ester bond. b) The gene for the bikunin protein also encodes another serum protein, α-1-microglobulin, which is linked with bikunin until the assembly of heavy chains is completed. The heavy chains are synthesized with both N- and C-terminal extensions. The N-terminal extension is removed unusually early in the endoplasmic reticulum. The C-terminal extension is released in the trans-Golgi, presumably by a mechanism of low pH-triggered autocatalytic cleavage. The mechanism for the esterification of a heavy chain with the chondroitin sulfate of bikunin is as yet unknown. c). The conservation of the chondroitin sulfate attachment site in bikunin (marked with * in b). The arrows indicate the proteolytic sites for the separation of α-1-microglobulin and bikunin. The heavy chains are synthesized with both N- and C-terminal extensions (Fig.1b). Their N-terminal propeptides appear to be removed in the endoplasmic reticulum, unusually early for secretory proteins.9 The large C-terminal extensions consisting of 240-300 amino acid residues are released during the esterification of heavy chains on the chondroitin sulfate chain in the trans-Golgi. The N-terminal extension seems to have no effect on the synthesis and secretion of ITI family molecules. However, the C-terminal peptides are necessary for the esterification because a heavy chain lacking the C-terminal peptide did not become linked to co-expressed bikunin in CHO cells.10 The sequence PHFII (Pro-His-Phe-Ile-Ile) that immediately follows the esterifying aspartic acid residue (D) is conserved in all three heavy chains of various species. No proteinase with such a specificity has ever been described. Recent work indicated that low pH could trigger an autocatalytic cleavage between D(Asp) and P(Pro) and that the cleavage is modulated by some sequence in the C-terminal peptide.11 However, how the ester bond is formed between the aspartic acid residue and chondroitin sulfate is still an enigma. ITI family molecules are abundant in blood at concentrations of 0.15-0.5 mg/ml, with only a small portion in the form of heavy chain-free bikunin. However, free bikunin is the predominant form in urine, where it is usually referred to as urinary trypsin inhibitor (UTI). Therefore, bikunin could be considered as the metabolic product of ITI family molecules that is excreted into the urine. The structural analysis of the carbohydrate-protein linkage region of the SHAP- hyaluronan complex revealed an ester bond between the C-6 hydroxyl group of an internal GlcNAc residue of hyaluronan and the α-carboxyl group of the C-terminal aspartic acid residue of a heavy chain2 (Fig. 2a). This ester bond, then, is equivalent to those in ITI family molecules in that the GlcNAc is substituted for a GalNAc in chondroitin sulfate. Therefore, the formation of the SHAP-hyaluronan complex is a substitution reaction, in which hyaluronan replaces the chondroitin sulfate chain of bikunin (Fig. 2b). The structure of the SHAP-hyaluronan complex purified from pathological synovial fluids indicates that a hyaluronan with a molecular weight of 2 million is substituted with 3-5 SHAP molecules (our unpublished observation). Such multivalency of the SHAP-hyaluronan complex appears to be important for functions of hyaluronan in extracellular matrices. Fig. 2　Schematic representation of the formation of the SHAP-hyaluronan complex. a) The structure of the protein-glycosaminoglycan linkage region of the SHAP-hyaluronan complex. Each SHAP is linked to hyaluronan via an ester bond between the α-carboxyl group of the C-terminal aspartic acid and a C-6 hydroxyl group of an internal GlcNAc of hyaluronan. b) Hyaluronan displaces the chondroitin sulfate of bikunin and forms an ester bond with a heavy chain accompanied by the release of bikunin. The SHAP-hyaluronan complex can easily be formed in vitro from ITI and hyaluronan in the presence of an as yet unidentified enzyme activity.1,3 This activity is present in serum as well as in the conditioned media of cultured cells, such as granulosa cells,12 hepatocellular carcinoma cells, glioma cells and lung fibroblasts. The reaction requires divalent cations because the addition of EDTA completely inhibits the formation of the SHAP-hyaluronan complex. Protease inhibitors have no effect on the activity, suggesting that proteolysis of heavy chains is not necessary for transfer to hyaluronan.3 Hyaluronan oligomers, octasaccharide and larger, were competitive inhibitors. None of the other glycosaminoglycans (chondroitin, chondroitin sulfate, dermatan sulfate, heparan sulfate, and dextran sulfate) was either a substrate or a competitor, even at the very high concentrations of 5 mg/ml.1 Interestingly, the presence of PG-M/versican significantly enhanced the formation reaction. The C-terminus of SHAP interacts near or on the hyaluronan-binding site in the G1 domain of PG-M/versican.13 Therefore, PG-M/versican may facilitate the reaction between ITI and hyaluronan by bringing them physically closer together. The heavy chains are assembled selectively on the chondroitin sulfate of bikunin since they do not appear to be assembled on other liver-derived serum chondroitin sulfate proteoglycans, such as C1q inhibitor.14 The mechanism for such specificity is unclear. The sulfation at position 4 of a Gal residue in the chondroitin sulfate-protein linkage structure HexUA-Gal(4S)-Gal-Xyl-Ser is commonly found in ITI and UTI, in sharp contrast to the heterogeneity of sulfation in this region for the cartilage chondroitin sulfate proteoglycans.16 The serine at the chondroitin sulfate attachment site and adjacent residues in bikunin are well conserved among species ranging from fish to human beings (Fig. 1c). Interestingly, this serine is a much better acceptor for β-D-xylosyltransferase, which initiates the biosynthesis of chondroitin sulfate, than those in the cartilage proteoglycans, as revealed by comparing the recombinant unglycosylated bikunin with the deglycosylated aggrecan core protein from bovine nasal septum cartilage (Km = 0.9 µM and 155 µM, respectively). 17 Whether or not these distinct characteristics are related to the selectivity of the bikunin proteoglycan for SHAP substitution remains to be examined. The function of the SHAP-hyaluronan complex in vivo was clarified in a mouse model in which its formation was abolished as a result of the inactivation of the bikunin gene.14 These knockout mice contain high levels of heavy chains, but no ITI family molecules. The ITI-deficient mice exhibit severe female infertility due to an abnormality in the cumulus oophorus expansion in preovulatory follicles (Fig. 3). It is well known that the cumulus oophorus expansion involves the deposition of an extensive hyaluronan-rich extracellular matrix.b In bikunin-null mice, the cumulus cells are irregularly arranged in the cumulus oophorus, even scattered in the antral cavity of the follicle, indicative of a defect in the formation of the cumulus hyaluronan-rich matrix. Indeed, all ovulated oocytes in oviducts are denuded at 0.5 day post coitus(dpc) in bikunin-null mice, in sharp contrast to the cumulus-oocyte complexes observed in wild-type mice (Fig. 3c). The defect in cumulus oophorus expansion causes a significant intrafollicular retention of oocytes. The number of ovulated oocytes was reduced by 57% in the null mice. Furthermore, the fertilization efficiency of the oocytes in bikunin-null mice is also significantly decreased. These consequences lead to the severe female infertility of bikunin-null mice. Importantly, intraperitoneal injection of purified ITI, together with the ovulation-priming gonadotropin, restores cumulus oophorus expansion and normal fertility. The data, therefore, established that the circulating ITI family molecules participate in the construction of the hyaluronan-rich cumulus oophorus matrix, most likely by forming the SHAP-hyaluronan complex with hyaluronan secreted by the cumulus cells, and that this is essential for the function of cumulus oophorus structure. The results from this mouse model suggest a possible mechanism of SHAP-hyaluronan complex deficiency for infertility in women, particularly the unexplained infertility in about 15% of the total infertile couples, in whom it is difficult to find any ovulated cumulus oophorus. b See review by Salustri and Fulop in this series. Fig. 3　The formation of the SHAP-hyaluronan complex in the cumulus oophorus matrix is essential for ovulation and fertilization. a) The immunolocalization of SHAP in the hyaluronan-rich extracellular matrix of cumulus oophorus. SHAP (red) colocalizes well with hyaluronan (green) throughout the network of the hyaluronan-rich matrix. b) When the formation of the SHAP-hyaluronan complex is abrogated in mice, the formation of the cumulus oophorus structure is impaired. The cumulus cells are irregularly arranged. Sections of mouse ovaries at 10 hours post human chorionic gonadotropin (hCG) priming, stained with hematoxylin-eosin. c) The defect in cumulus oophorus matrix formation causes significant intrafollicular retention of oocytes.8 No fertilization was observed in 1.5 dpc homozygous oocytes. How the SHAP-hyaluronan complex participates in the matrix formation is not clear at this time. In addition to the PG-M/versican-SHAP interaction mentioned above, another important candidate is the product of Tumor necrosis factor-Stimulated Gene-6 (TSG-6), an ~35 kDa glycoprotein with a hyaluronan-binding link module domain.19 The expression of the TSG-6 gene is transiently upregulated in expanding cumulus oophorus with a time course similar to that observed for hyaluronan synthase-2 in the same tissue.20 The latest results reveal that the TSG-6 protein is present in cumulus oophorus matrices, and importantly, that a subpopulation of the protein forms an apparently ovalent complex with SHAP.21,22 This finding suggests a novel mechanism underlying the formation of hyaluronan-rich matrices, that is, crosslinking of hyaluronan chains via the SHAP-TSG-6 complex. It is noteworthy that the cumulus TSG-6-SHAP complex contains no bikunin and is resistant to chondroitinase ABC digestion. Therefore, it is distinct from the previously described TSG-6-ITI complex in synovial fluids, wherein TSG-6 appears to link to the chondroitin sulfate chain of ITI by replacing a heavy chain. The deficiency of SHAP-hyaluronan complexes in the bikunin-null mice did not cause other significant abnormalities even in mice older than 1 year, implying that formation of the SHAP-hyaluronan complex may be primarily involved in responses to abnormal conditions rather than to normal development and homeostasis. In general, ITI family molecules and hyaluronan are distributed in different body compartments, i.e., in circulating blood and in connective tissues, respectively. Experiments in vitro showed that simple mixing of serum and hyaluronan followed by incubation at 37°C are sufficient to form the SHAP-hyaluronan complex.1,3 Therefore, the convergence of serum and hyaluronan seems to be the rate-limiting step, which is consistent with the above hypothesis (Fig. 4). This is also supported by the fact that the SHAP-hyaluronan complexes are present in large amounts in the synovial fluid of patients suffering from rheumatoid arthritis, but are absent in normal joints26 The role of the SHAP-hyaluronan complex in inflammatory reactions might be to modify the CD44-hyaluronan interaction that mediates leukocyte activation and invasion.c Additionally, TSG-6 expression is also upregulated in inflammatory sites. It has been shown that TSG-6 greatly enhances the protease inhibitory activity of bikunin by forming the TSG-6-ITI complex.27 The identification of the covalent TSG-6-SHAP complex now makes it possible to examine its roles in inflammatory processes in the context of organization of hyaluronan-rich matrices and modification of hyaluronan functions. Fig. 4　Schematic representation of the formation, regulation and physiological function of the SHAP-hyaluronan complex. The circulating ITI family molecules are recruited in response to proper stimuli to local sites where the hyaluronan synthesis level is elevated. The heavy chains of ITI family molecules are transferred to the newly synthesized hyaluronan chains to form the SHAP-hyaluronan complexes, which subsequently play roles in local physiological or pathological events, such as the construction of the cumulus oophorus matrix in ovulation and possibly the interaction of local cells and mononuclear leukocytes in inflammatory responses. Forty years after the discovery of ITI, the physiological functions of this complex and fascinating family of molecules are becoming clear by investigation of the covalent interactions they promote between heavy chains (SHAPs) and hyaluronan as well as with TSG-6. It brings a new insight into the functional regulation of hyaluronan, one of the most important molecules in connective tissues. Many important questions remain to be answered, for example, the mechanism for heavy chain assembly with bikunin, the identity of the enzymatic factor(s), how the efflux of the ITI family is controlled, how the SHAP-hyaluronan complex organizes the construction of hyaluronan-rich extracellular matrices, and how SHAP-binding affects the interaction of hyaluronan with specific receptors such as CD44 and TSG-6. 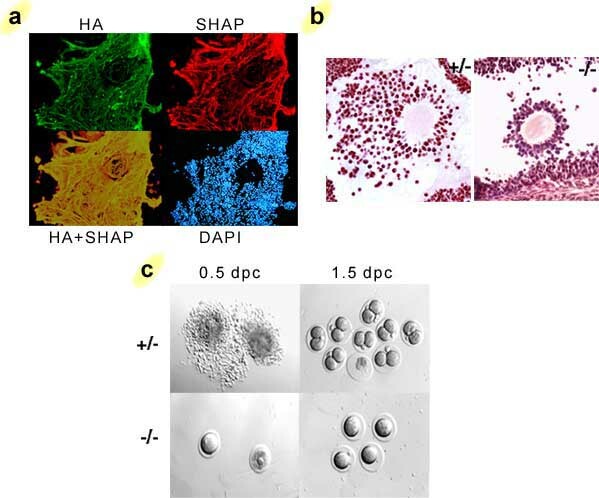 Formation of the SHAP-hyaluronan complex may represent a new target for controlling some hyaluronan-related pathological events.